Customize your party look with this Picnic Party Personalized Pennant Banner. Bearing the charming red and white gingham print, this easy to use banner comes with peel and stick chalkboard style letter stickers so you can create your own special headlines. Perfect for outdoor picnics, pool parties, or backyard barbecues. 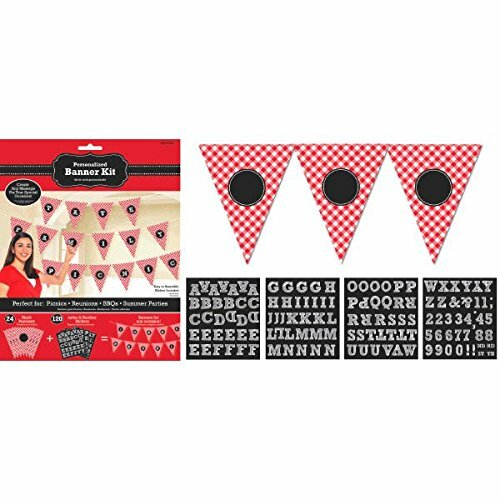 Feature red and white gingham printed paper pennants with chalk-script letter, number and character stickers in the black circles. Personalize your banner with 120 letter, number and character stickers. Each pennant measures 10 1/2" x 8 1/2". Includes 26 feet of 1/4" white ribbon.